Senator JV Ejercito wants the Senate to examine the Aquino administration’s controversial Disbursement Acceleration Program (DAP) which drew flak from legal experts as unconstitutional. 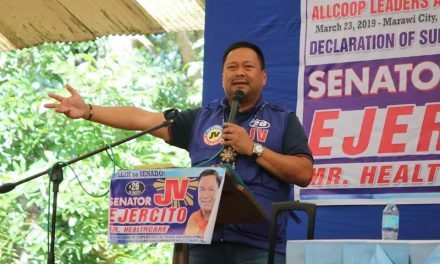 Through Senate Resolution 287, Ejercito sought for an inquiry in aid of legislation on the clear violation and realignment of P72.11 Billion worth of DAP funds from slow-moving projects, pegged as government savings by the Department of Budget and Management. After the pork barrel probe, ‘incentives’ allegedly given to senators and congressmen who voted for the impeachment of former Supreme Court Chief Justice Renato Corona in 2012 through DAP and the misuse of Malampaya Funds should also be investigated. As fiscalizer, Ejercito said the inquiry would focus on formulating policies and regulations on the proper use of savings and budget augmentation of the government.